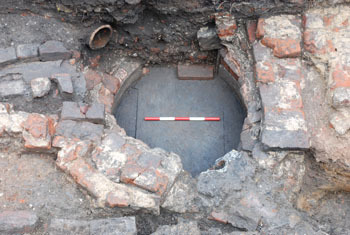 We undertake evaluations on many development sites, as a way of establishing the presence or absence of archaeology. This typically involves the investigation of trial trenches within the development footprint. 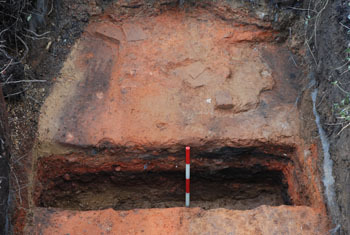 These evaluations are used to establish whether or not further archaeological mitigation is required - such as further on-site work before or during development, or preservation in situ. Recent evaluations include work at Highgate School before the development of a new teaching building. 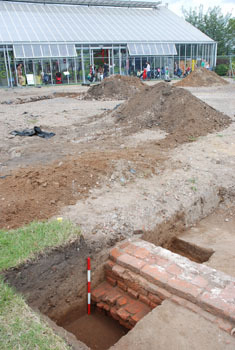 This uncovered 17th - 18th Century backyard activity and the probable remains of a 16th Century brick clamp. 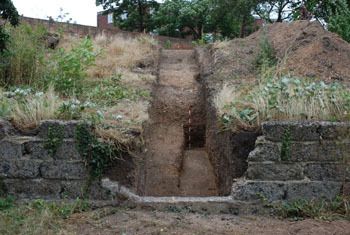 Other examples of evaluations undertaken include Rainham Hall, where we were looking for evidence for the original 1720s garden design, an evaluation at the Royal Botanic Gardens Kew which uncovered a brick wall that was part of Kew Farm and probably dated to the early 1630s, and an evaluation at Cheyne Walk where the remains of an early 17th Century basement and oven were uncovered.